Russia’s transport aviation earns income from foreign wars, and will continue to do so. 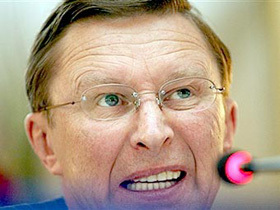 As RIA Novosti reports, such were the words of Deputy Prime Minister Sergei Ivanov, who was speaking at the 12th St. Petersburg International Economic Forum on June 8th. Ivanov went on to say that the state must play a leading role in creating an economic system based on innovation. It was earlier reported that First Deputy Prime Minister Igor Shuvalov instructed the Government to complete work on transferring control of several hundred enterprises to Rostekhnologia by June 9th. As many as 600 companies may become a part of Rostekhnologia, which has raised the ire of the Federal Anti-Monopoly Service (FAS) and the Finance Ministry. FAS has raised questions about transferring shares of privately-owned companies, such as vehicle manufacturers Kamaz and UAZ, to a state corporation. The Finance Ministry, for its part, has protested the inclusion of enterprises not directly involved in the military-industrial complex into Rostekhnologia.